Mangalarga Marchador comes from Brazil. They possess Alter-Real blood lines that went on to be called Sublime Horses. They have a very unique gait that appears to look somewhat like a march when they walk and gallop. This gait is referred to as the marcha. In the eighteen hundreds the Sublime horses began to be purchased by those called the Hacienda Mangalarga group. It was at this point that they were no longer known as the Sublime horses and changed to the Mangalarga Marchador style of horses. They are notorious for their variances in marches including the marcha picada, the marcha batida, and the center march. 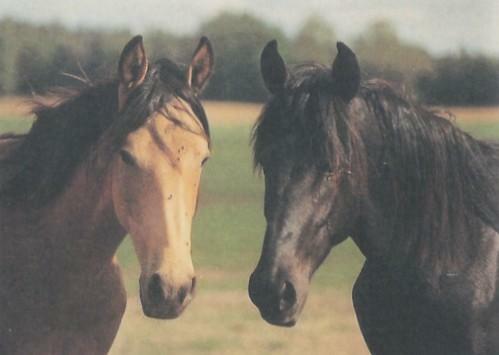 One is slower, one is a diagonal pace, and the last one is thought to mimic the unique style of the Tennessee Walking Horse. Mangalarga Marchador horses can be utilized for harness work, riding duties, and competitions. They are fun loving, smart, and well gaited. They are known for being comfortable to ride on and fast runners when they need to be. Their looks and great stride helps them to do very well in competitions. They can be found in Sao Paulo, Brasilia, Goias Bahia, Minas Gerais, Espirito Santo, Rio De Janeiro, and Brazil. They generally stand at around sixteen hands in full grown size with a beautiful and shiny coat. They have long legs, powerful shoulders, and a high set tail. They can be bred in the following coats: chestnut, bay, roan, gray, and dun. They look very much like most of the other Barb styled horses and are noted to be extremely smart.